Rural Water Systems for Multiple Uses and Livelihood Security covers the technological, institutional, and policy choices for building rural water supply systems that are sustainable from physical, economic, and ecological points-of-view in developing countries. While there is abundant theoretical discourse on designing village water supply schemes as multiple use systems, there is too little understanding of the type of water needs in rural households, how they vary across socio-economic and climatic settings, the extent to which these needs are met by the existing single use water supply schemes, and what mechanisms exist to take care of unmet demands. The case studies presented in the book from different agro ecological regions quantify these benefits under different agro ecological settings, also examining the economic and environmental trade-offs in maximizing benefits. 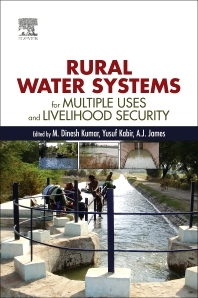 This book demonstrates how various physical and socio-economic processes alter the hydrology of tanks in rural settings, thereby affecting their performance, also including quantitative criteria that can be used to select tanks suitable for rehabilitation. 7.2. Cause of Decline of Tanks: Contested Terrains? M. Dinesh Kumar received his Ph. D in Water Management in 2006. He has 24 years of professional experience in the field of water resources. He is currently the Executive Director of Institute for Resource Analysis and Policy in Hyderabad. He has nearly 150 publications to his credit, including books from internationally renowned publishers, book chapters, many articles in peer reviewed international journals, research monographs and conference papers. He has authored five books and is the lead editor of two edited volumes. He has published extensively in many international peer reviewed journals, such as Water Policy, Energy Policy, Food Security, Water International, Journal of Hydrology, Water Resources Management and Resources, Energy and Development. He is currently also Associate Editor of Water Policy, and Member of the Editorial Board of International Journal of Water Resources Development. Yusuf Kabir has 15 years of experience working in water supply and sanitation sector. Yusuf has been with UNICEF since 2007. Prior to that he has worked with organizations like DFID, National Level NGOs, Social and Marketing research consultancy firms like GFK-MODE, ORG India Pvt Ltd, Ramky Infrastructure, SREI Capital Markets, SPAN Consultancy, on issues related with Environmental and livelihood development training and capacity building in the social sector, etc. Yusuf is a commonwealth scholar and a trained policy writer from Central European University, Budapest, Hungary. A J James has over 20 years of research and work experience in a wide-range of rural development issues in India, including water resource management, watershed development, water and sanitation, water pollution, adaptation to climate change, natural resource management, agricultural development, forestry, and poverty alleviation. Another area of specialization is monitoring and evaluation, where he has helped develop innovative methodologies for community-level assessment of qualitative information. He has worked all over India, and also in Nepal, Sri Lanka, Vietnam, Ethiopia and Afghanistan, for major government and donor-supported development projects. His clients include major funding agencies, research & development institutions, consulting firms in India and abroad, as well as non-governmental organisations and government agencies.